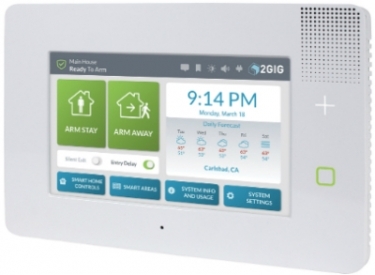 During ISC West, 2GIG showed off its new GC2e and GC3e security panels, as well as a new line of fully encrypted sensors. Both new panels support all traditional 2GIG sensors and other legacy 345 sensors for easy system upgrades. The introduction was made at ISC West 2019 in Nortek Security & Control Booth #20015 in Las Vegas. In an announcement, Nortek Security & Control Vice President of Products Quinto Petrucci states the 2GIG eSeries offers both end users and dealers an enhanced security and control ecosystem that builds on the reliability and peace-of-mind that are synonymous with the 2GIG name. “This is a major update to the line, designed to benefit both dealers and their homeowner customers,” Petrucci says. “For homeowners, the new encrypted sensors enhance peace of mind, knowing their system is even more secure and resistant to hacks and breaches. The new panels deliver an upgraded user experience, including a contemporary new design that will look at home in any setting. “For dealers, the encrypted sensors will only communicate with an eSeries panel, which prevents a competitor from taking over an eSeries installation by only installing a new panel,” he continues. Compatible encrypted 2GIG sensors include the standard door/window sensor, motion sensor, glass break sensor, key fob sensor and recessed D/W sensor. More sensors are to come in the near future, according to the company. Also, the two new panels support all traditional 2GIG sensors and other legacy 345 sensors for easy system upgrades. “For dealers, this is a best-of-both,” Petrucci comments. The new GC2e panel includes a larger, brighter 5-inch capacitive touchscreen, while the GC3e features a 7-inch touchscreen. Both panels have best-in-class 2-way audio and front-firing speakers for exceptional audio performance, according to the company. Additionally, the new GC3e panel exclusively includes the 2GIG Smart Areas feature, enabling security partitioning that makes it easier than ever to set up independently protected areas in homes. "Smart Areas delivers greater personalization and functionality for the end user, while simplifying installation for the dealer. Think of it as four systems for the price of one,” says Petrucci. This article originally appeared on our sister publication Security Sales & Integration's website.